Hello everyone! I was always want to show a group of planes one by one rolling in sky by modeling, but couldn't fine a good way to show that, until one day, a friend introduced me Eduard 1/144 Spitfire, then suddenly I got an idea! That is use this 144th kit, along with a 72nd kit, mix these two scales into one diorama. 72nd one on near side, the 144th one on far side, that should show a “near big and far small” view(or perspective view? I don't know correct way in English). Then set each of them in a particular angle, so that may work. 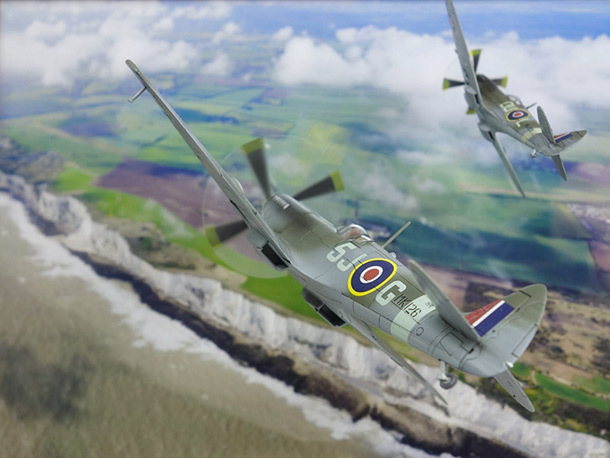 Since Spitfire has been choose, I though story background should best to show some British way, and, with a warm story such as back home could be better than combat story. The famous white Dover cliff no doubt is the best way for this story. So, I thought: that it, start to built it! I choose Eduard 144th Spitfire Mk.IX, and an Italeri kit as 72nd one. Painted with late RAF camouflage, and very light wethering, after all, wethering isn't the point, right? Notice the pilots, these two kits didn't contain, so I cut two plastic stick, painted with brown, to simulate pilot. Then drill a hole, for TAMIYA clear plastic pipe, which is the way to fix plane on the background. Notice these two pipes are different angle. To show the spinning propeller is another keypoint. I chose a cell phone screen film, cut a circle with circle cut. The cut paper templet to paint the spinning propeller. And adjust two planes angle, make it looks like the 144th Spitfire is leading the 72nd Spitfire rolling and return to airbase. Вроде бы и трубочки-кронштейны ,и пропеллеры , и сама затея в целом слегка наивная. А вот впечатление в итоге работа необъяснимо производит! Автор молодец! О да! Работа производит впечатление! Очень интересная идея и реализация замечательная!